Scottsdale Ranch is home to over 250 waterfront luxury homes that surround Lake Serena. Scottsdale Ranch, a 1,100 acre residential development, includes custom luxury homes, townhouses, condominiums, single family and patio homes. Conveniently located next to this lake community is Scottsdale Ranch Park, a 31 acre park that offers a variety of recreational activities. 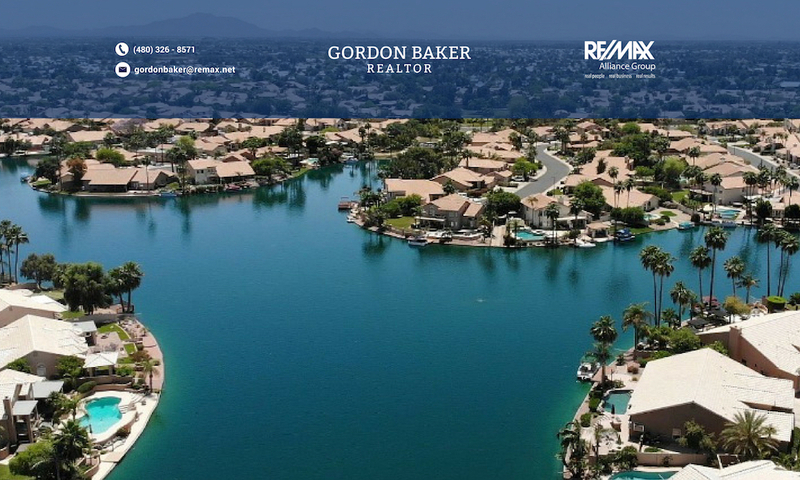 Scottsdale Ranch waterfront neighborhoods include Lakeview and Bayview Estates, Las Brisas, Charter Point, The Landings, Monterey Point, Lake Serena Estates, The Watefront, and The Island. The Island at Scottsdale Ranch, an island subdivision of approximately 100 homes is a gated community completely surrounded by Lake Serena with one road for access. Not exactly what you would expect in the desert! The numerous subdivisons within Scottsdale Ranch offer variety and distinction to the community. You will find homes by builders including Geoffry H. Edmunds, Costain Arizona, Scholz Design Builders, Dix Custom Homes, Golden Heritage, Trammel Crow, LaBlonde Development, Felker and others. Lake Serena, a 42 acre man made lake with 5 miles of shore line is open to all residents for boating and fishing. The SRCA offers residents free usage of a variety of watercraft. When you’re entertaining larger groups, Scottsdale Ranch residents have access to the community center for a reasonable fee. In the heart of the community is Scottsdale Ranch park, a multi-generational facility that includes the Via Linda Senior Center, and Scottsdale Ranch Desert Garden. An abundance of amenities in the park include a tennis center with 18 lighted courts, 4 lighted racquetball courts, 6 lighted sand volleyball courts, 1 lighted squash court, 4 lighted half court basketball courts and 2 lighted baseball fields. Laguna Elementary, an award winning elementary school, is located next to Scottsdale Ranch Park. The park also host Pop Warner football, Little League and Arcadia Soccer Leagues. The Virgina G. Piper branch of the Boys and Girls Club of greater Scottsale is located next to Laguna Elementary. If you would like to receive updated listings of homes in Scottsdale Ranch or other Scottsdale waterfront homes, click on Receive Scottsdale waterfront homes via e-mail. To search for waterfront homes, go to Advanced Waterfront Search. $100+K UNDER APPRAISAL MASSIVE $20+K REDUCTION MOTIVATED SELLER BRING ALL OFFERS water, sophisticated & high styled, maple floors, new carpet, 3 bedrooms, 3 ensuite baths. Water Views from most rooms, sweeping expansive veranda showcases the lake w/access out from granite white cabinetry kitchen, dining rm/great room & master bedroom. Halogen lighting, media built-in+ gas fireplace in great room, curved walled eat in kitchen area, pendant & can lighting, direct access garage w/wall of built ins. Gated entry to front door but garage accessible. White Granite counters & dual breakfast bar, contemporary flair. House being PAINTED FEB 28-MARCH 6 showing ok, windows cleaned and prof cleaned after paint done. A charming ''Venetian Canal'' style residence in a tucked away highly desirable central Scottsdale community that has class, charm and a lush lake/waterfront location. Complete with walking paths, a guard gated entrance, tennis court and 3 pools, this home and neighborhood has lots to offer.A spacious, spotless waterfront patio home has gorgeous back patio views from both living and master suite spaces bringing serenity and life with the occasional geese and neighbors walking the paths to greet and say hello. Complete with lovely Master w/ walk in closet and a cozy kitchen with eat in breakfast nook, sit at bar as well as great room feel opens to a spacious living room gas fireplace & a wall of windows brings in fresh sunlight & the fountain sounds from this waterfront community. This home in lovely Las Brisas in Scottsdale Ranch is an impeccable move-in ready updated immaculately maintained 2 bedroom 2 bathroom patio home. Amenities at this home include vaulted ceilings, lots of windows and 5 sliding glass doors for plenty of light. Updates include granite countertops, NEW kitchen cabinets with slide out shelves and flooring throughout. Second bedroom has a built-in wall unit with a desk and a TV cabinet. Stainless appliances are top end with a Sub Zero refrigerator, Wolf microwave and Dacor cooktop, oven and separate warming oven. Bathrooms have been totally remolded with a Jacuzzi tub and walk in shower.Amenities include a large laundry room with a sink, epoxy garage floor and built in garage cabinets. This property has everything you need, don't miss it! Beautiful waterfront properties – many of our Seattle waterfront owners will buy AZ waterfront as their “winter homes”. Looks like a good area to keep in mind. Previous PostPrevious Phoenix Real Estate Buyers Market?